Roasting is a classic preparation method for meats, vegetables and even fruits. Our culinary team loves this technique, especially this time of year. As Chef Kevin always says: “It doesn’t take much effort, and the results are impressive”. Recent trends have proven that the classic french preparations are not the only way to go and we incorporate other world cuisines into the ingredients to give them a little extra excitement! There are just two steps for this recipe, so you know it’s simple—not to mention delicious. 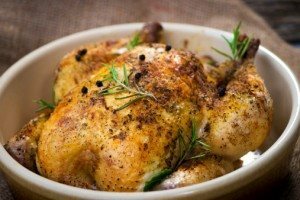 You’ll toss chicken with rosemary, olive oil, lemon juice, garlic, lemon and salt and pepper. Arrange it in a baking dish and roast. Dinner will be on the table in less than an hour. Get the recipe here. This simple but delicious recipe involves Golden Delicious apples, ground chicken, whole wheat bread, fennel seeds, parsley apple jelly and Dijon mustard. Although you need to use a food processor to pulse the bread into crumbs, this recipe takes less than 30 minutes to prepare. You’ll find it here. You can’t beat this recipe for the holidays—or for any night you want to treat your family. There are few ingredients—just dried morels, butter, vegetable oil, shallots, heavy cream and, of course, beef tenderloin. Get the recipe here. This is a delicious combo of turkey, Italian sausage, onion, dried apricots, fresh parsley and sage, and stuffing. It’s a little more involved than the other recipes, but it could make for a memorable Thanksgiving meal—and plenty of leftovers. You’ll find the recipe here.